Every year, Central Penn Business Journal publishes its Book of Lists, a directory of the top companies throughout central Pennsylvania. These lists show the "who's who" of various industries in terms of size and revenue. But as a marketing agency we're always interested in what top local business are doing with their websites and marketing. So we wondered: which local businesses have the top websites? If you find this information useful, and you'd like to see research on your industry, let us know! Note: Because we wanted to focus on local businesses, we omitted CPBJ's Engineering firms and Environmental contractors, many of whom are big firms doing a large percentage of their business outside the local area. 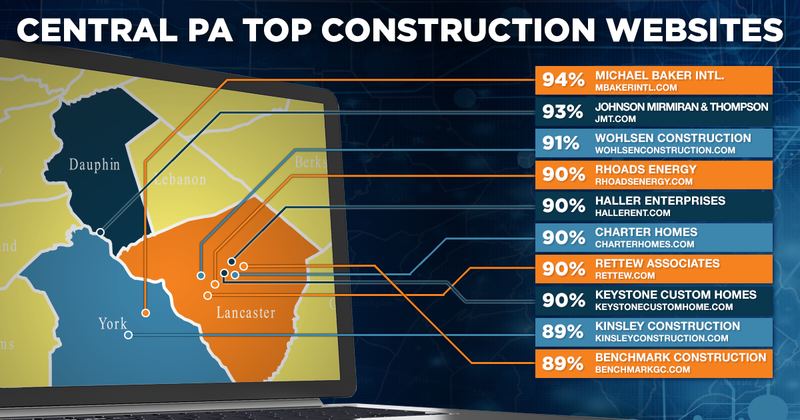 We researched the websites of top Construction companies as listed in Central Penn Business Journal's 2019 Book of Lists. Using website/SEO auditing tools, we collected website analytics scores for each business, then converted them into a standardized Website Rating from 0-100%. The higher the Website Rating, the more prominent and visible the website is online - meaning more traffic, more backlinks, and better search engine rankings. Alexa Rank - ranks a website's popularity based on daily visitors and page views. Lower scores are better. SEMrush Authority Score - measures the overall quality of a domain based on backlinks, organic search metrics, and website traffic. Higher scores are better. Ahrefs Domain Rating - measures the strength of a website based on the number and quality of backlinks. Higher scores are better. 98% of Central PA's top construction companies have websites - If you're going to have a successful, growing business, you need a website. Out of all the construction companies in the Book of Lists, only (2) did not have a website. There is a relationship between good Website Ratings and higher Revenue - as we expected, having a strong website does play a role in business success. While it's only one piece of your marketing mix, our research did show a moderate correlation between website ratings and revenue figures. The bigger the company, the stronger the correlation between Revenue and Website Rating - while the smallest businesses showed more variation, larger companies almost always had stronger websites and better scores across the board. The message is clear: if you're looking to really grow your business, a great website that ranks well and brings in traffic is a key part of your marketing. 74% Herbert Rowland & Grubic Inc.
52% Richard L. Sensenig Co.
16% Commercial Flooring Professionals Inc.
15% Ames Janitorial Services Inc.
8% Triangle Fire Protection Inc.